Just after the official released of iOS 6.1 Beta 4 firmware for iPhone 5, iPhone 4S, iPhone 3GS, iPad 4, iPad 3, iPad 2, iPad Mini, iPod 5G Touch and iPod 4G Touch , Apple has now officially releases its newest and final build of iOS 6.0.2 IPSW Firmware for iPhone 5 & iPad Mini devices. Yes, you get it correct, Apple iOS 6.0.2 Firmware is officially and exclusively available for only iPhone 5 GSM, iPhone 5 (CDMA) (Build 10A551), iPad Mini (Wi-Fi), iPad Mini (GSM), iPad Mini (CDMA) (Build 10A8500) devices which brings some minor and major improvements and bug fixes which includes bug fixes of impact Wi-Fi etc. 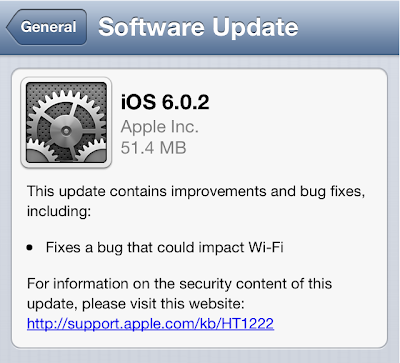 Full change log of iOS 6.0.2 available here, so if any user is facing Wi-Fi Connectivity issues and problems on iPhone 5 (GSM) (CDMA) or in iPad Mini (Wi-Fi) (GSM) (CDMA) device than you should update your current and old iOS 6.0.1 Firmware to the latest iOS 6.0.2 Firmware through OTA (Over-the-Air) wireless update process by simply going to Settings > General > Software Update on your respective Apple iDevice. Apple's iOS 6.0.2 IPSW Firmware is also available for download on iOS Dev Center Website and users can also Download and Install iOS 6.0.2 IPSW Firmware via Direct Download Links exclusively available for iPhone 5 GSM, iPhone 5 (CDMA) (Build 10A551), iPad Mini (Wi-Fi), iPad Mini (GSM), iPad Mini (CDMA) (Build 10A8500) devices below. If you are running an old iOS 6.0.1 Firmware on iPhone 5 GSM, iPhone 5 (CDMA), iPad Mini (Wi-Fi), iPad Mini (GSM), iPad Mini (CDMA) than should download and install iOS 6.0.2 Final Firmware from your respective devices via OTA (Over-the-Air). The over-the-air update size of file is approx. 51.4 MB or you can also download iOS 6.0.2 update via iTunes from our following official mirrors (Direct Download Links). Apple users can download and install iOS 6.0.2 setups files from the following official mirrors.